Recent research into the anatomy and pathophysiology of the blood-brain and blood-spinal cord barriers suggests that a breakdown in these barriers can result in several diseases affecting the central nervous system (CNS). 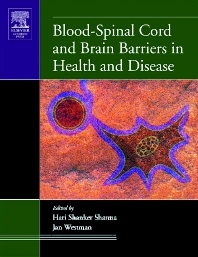 This book presents new findings in the area of blood-brain barrier research that suggest barriers play important roles in health and disease conditions. It also discusses the development of new drugs that can modulate the barrier function in the CNS and may provide new approaches to treating neurological diseases such as Alzheimer's disease and other motor neuron diseases, as well as spinal cord trauma. Researchers in neuroscience, drug discovery and development, and neuropathology. Dr. Hari Shanker Sharma, Professor of Neurobiology (MRC), Docent in Neuroanatomy (UU) is currently working in Uppsala University Hospital, Department of Surgical Sciences, Division of Anesthesiology & Intensive Care Medicine, Uppsala University, Sweden. Dr Sharma obtained his Masters Degree from Bihar University with special expertise in Cell Biology in 1976 and was awarded the Gold Medal of Bihar University for securing 1st position in the 1st Class. Dr Sharma joined the group of Professor Prasanta Kumar Dey, a neurophysiologist, by training in the Department of Physiology, Institute of Medical; Sciences, Banaras Hindu University, Varanasi in 1977 to obtain his Doctor of Philosophy Degree (D.Phil.) in Neurosciences and was awarded his Ph.D. in 1982 on “Blood-Brain Barrier in Stress.” After carrying out a series of Government of India funded Research Projects on the BBB and brain dysfunction (1982–1987), Dr Sharma joined the lab of Neuropathology at Uppsala University with Professor Yngve Olsson in 1988 to investigate passage of tracer transport across the BBB caused by stress or traumatic insults to the Brain and Spinal cord at light and electron microscopy. Dr Sharma was awarded the prestigious Alexander von Humboldt Foundation Fellowship of German Government (1989–1991) to work on hyperthermia induced BBB dysfunction at the ultrastructural level in the laboratory of Professor Jorge Cervós-Navarro (a living “Legend in Neuropathology in Europe”). Dr Sharma again joined Uppsala University and established a network of collaboration on “Experimental CNS Injury Research Group” as a lead investigator with eminent collaborators in various parts of Europe, USA, and Australia (1991–). On his work on hyperthermia Dr Sharma received the prestigious Neuroanatomy award “Rönnows Research prize” of Uppsala University for “best neuroanatomical research of the year 1996” followed by the Award of the Degree of Doctor of Medical Sciences of Uppsala University in Neuroanatomy in 1999 and selected for the Best Thesis Award of the Medical faculty, “The Hwassers Prize” of 1999. On his meticulous works on the Blood Brain barrier and Brain edema (2000–2003) Dr. Sharma earned the prestigious title of “Docent in Neuroanatomy” of Medical Faculty, Uppsala University in April 2004. Currently his main research interest is Neuroprotection and Neuroregeneration, in relation to the Blood-brain barrier in stress, trauma, and drugs of abuse in health and disease. Dr. Sharma on his research on brain pathology and neuroprotection in different models received the prestigious award from The Laerdal Foundation of Acute Medicine, Stavanger, Norway, in 2005 followed by Distinguished International Scientists Collaboration Award by National Institute on Drug Abuse (NIDA), Baltimore, MD (2006–2008). His recent work on 5-HT3 receptor mediated neuroprotection in morphine withdrawal induced neurotoxicity won the coveted prize of Best Investigator Award 2008 and Best Scientific Presentation by European Federation of the International Association for Study of Pain (ISAP), and Awarded during their VI Annual Meeting in Lisbon, September 9–12, 2008. His recent research is aimed to find out the role of nanoparticles in Neurodegeneration and Neuroprotection using various treatment strategies that is supported by European Aerospace Research and Development (EOARD), London, UK and US Air Force Research Laboratory, Wright Patterson Air Force Base, Dayton, Oh, USA. On his works on Blood–brain barrier in hypertension and diabetes together with Romanian colleagues, University of Medicine and Pharmacy “Iuliu Hatieganu,” Cluj-Napoca, Romania awarded Dr. Sharma with Honorary Doctorate of Medical Sciences in 2009. Dr Sharma’s work over 30 years on the blood-brain barrier and brain edema won him the US Neurosurgeon Dr Anthony Marmarou Award (2011) by the International Brain Edema Society at their 15th Congress in Tokyo, Japan, November 2011. His works on Nanoneuroscience and development of nanomedicine to treat the CNS injuries has won accolades at various Government and International Scotties or Organization across the World. Accordingly Dr Sharma was decorated with the most prestigious ”Hind Rattan Award 2012” on the eve of Republic Day of India in January 2012 and Mahatma Gandhi Pravasi Gold Medal in October 2012 in House of Lords, London, UK. Dr Sharma was also invited to organize and chair Nanosymposium in Society for Neuroscience meetings in Chicago (2009), San Diego (2010), Washington DC (2011) and New Orleans (2012). Dr Sharma has published over 380 research papers, 75 reviews, 12 monographs, and 70 international book chapters and edited 15 book volumes.